← Newman’s Own makes licorice, and it’s good! Do you like the Zero Bar? I’m curious…. Apparently lots of people love this candy…I tried one today for the first time, and it’s not for this girl. 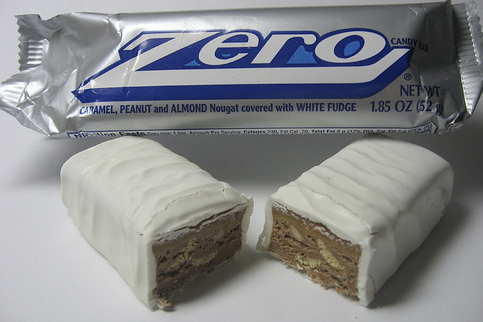 Look on the internet and you’ll find fans waxing poetic about the Zero bar, but I just don’t get it. The center is a whipped chocolate nougat, combined with almonds and peanuts, all robed in some sort of white fudgy coating, not white chocolate. I detect a malt/almond flavoring, and this may be the problem, I do not like malt, except for malt balls. (yeah, I know, odd). I even put the bar in the freezer, trying to improve the taste. Don’t bother… a frozen Zero bar is impossible to eat, and the coating drops off in your lap when you bite into it. Created in 1920, thought to be named zero because it’s white (as in zero degrees), back in the day there was a polar bear on the wrapper, it has gone through 2 company takeovers and survived. It’s now made by Hershey. It is a mystery to me how this candy lives on when the Marathon bar exists only in our memories. If you like the Zero, please let me know what I am missing.